911uk.com - Porsche Forum : View topic - No more NA 911 - not even GT3! 911uk.com Forum Index > All New 992 (2018 - current) > No more NA 911 - not even GT3! Posted: Wed Feb 01, 2017 11:19 am Post subject: No more NA 911 - not even GT3! The next Porsche 911 will exclusively use turbocharged six-cylinder engines when it arrives in 2019, including the GT3, marking the end of naturally aspirated units for the line-up. The GT3 will deliver more than 500bhp, while the standard models are set to get an extra 10-15bhp over today’s Carrera and Carrera S when they arrive in 2019. The current Carrera and Carrera S deliver 364bhp and 414bhp respectively, so the 992-generation 911 will produce from around 375bhp to 429bhp. A hybrid 911 will also be introduced to the range in 2020. It will run the flat six with an electric motor providing limited all-electric and performance-boosting functions. 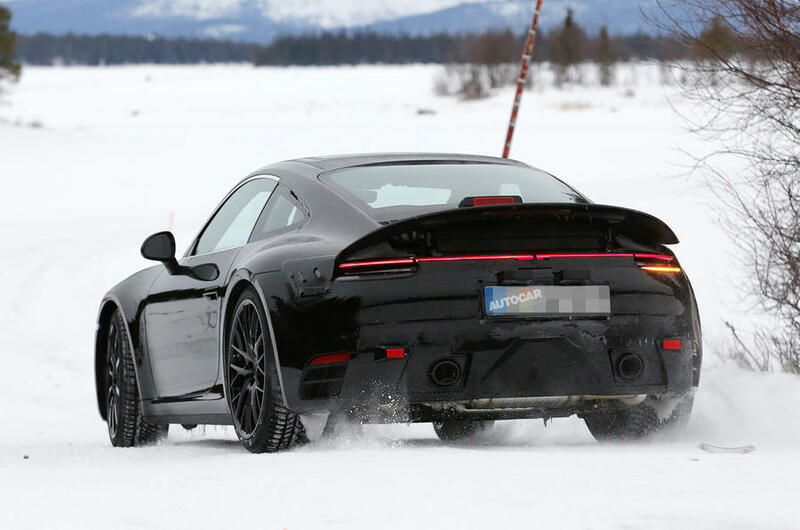 Spotted testing for the first time in the Arctic Circle, the 992 remains the same length as today’s 991 model, but the width of the car is set to increase slightly due to wider tracks. There’s also only a minor growth in wheelbase; Porsche grew the wheelbase dramatically for the current generation to create more interior space for rear seat passengers. The 992 will be based on what is billed as a new modular sports car platform, although in reality it is similar to the current 991 platform. With a modified rear end, it will be used under the next-generation versions of the entry-level Boxster and Cayman models and could also influence the design and engineering of future Audi R8 and Lamborghini Huracán models. 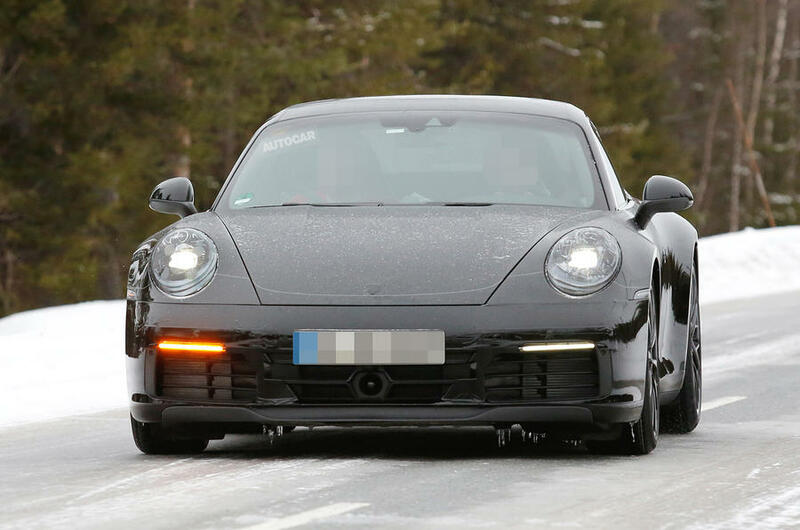 The eighth-generation 911 will have vastly improved active aerodynamics with a full-width rear wing. An active front spoiler is also a possibility, although this can’t be seen in these images. While the current facelifted 911 range has benefited from a number of weight savings, the 992 will receive even more, thanks to a greater proportion of high-strength steel and aluminium. However, carbonfibre will not be used in the structure of the standard models and will instead be reserved for high-end models such as the GT2 and GT3. Four-wheel-drive versions will also become more efficient due to new electronic control software. Meanwhile, the interior is expected to closely reflect that found in the second-generation Panamera. Yes, the beauty of the 911 was always its compact supercar status. Big performance in a space efficient small body to thread through the lanes, yet with boot space, passenger space and great visibility. Good news for 991.1 GT3 owners? hope they keep the back of the car similar to the photos, looks just like a V12 Vantage....only a good thing imo. 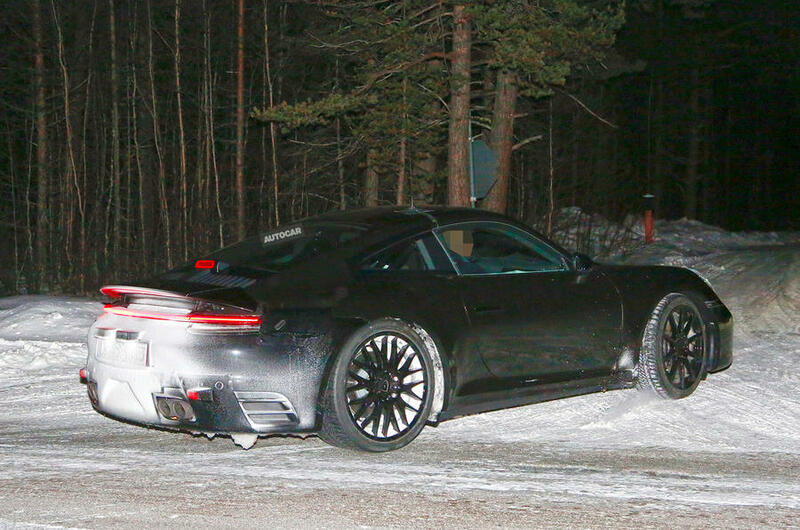 The current 991 turbo cab is bloody hideous from the rear and it seems to me that they are loosing the plot with 911. What is that rear wing ? Whilst it's disappointing that there'll be no more NA engines at least they've left it with 6 cylinders positioned in the right place so the next generation can still legitimately be called a 911. It would seem that this is great news for purists for those with NA GT cars but all this must be good for owners of turbocharged 911s built with performance in mind and not fuel economy etc? For example, 996Ts and 997Ts??? Seriously though, I've hankered after a GT3. Preferably a 991.2 but I guess that little dream is well and truly out the window now. Yeah the 991.2 GT3 has not even been released yet and already it's "last of the...."
I agree it does seem ridiculous that Porsche as part of the VW group are being driven into building smaller turbo motors yet Audi and Lambo can sell big NA motors. For me the size of new 911's is as much of an issue as the engine. Last year my local OPC lent me a 991.1 gts which was a great piece of kit but just to big on my small rural roads and not particularly involving at even licence threatening speeds. I love the 911 but for me it is increasingly becoming irrelevant as a sports car on our overly busy, pot holed, speed camera roads while trying to keep within badly conceived environmental legislation . It probably works better than ever for other markets such as Asia and mainly the US . I still think Porsche should have spent their time and effort using electric to keep the environmentalist's happy and produce torque fill for the petrol heads . The NSX gets close just to big and heavy, with light weight do we need more than 400 hp to have fun . They could make a 911+ with turbo motors mega power and the electric b*****s that I really don't care about one bit. Its all down hill from now.